Sometimes projects can be out of focus for a long time because of a problem which can not be solved at the time. The type 31 is one of those projects that was picked up again because it forms a good study object to do before tackling the type 29 and with an almost finished tender this seemed a logical thing to do. Above a sketch of the type 31 using dimensions taken from the fiche and calculated from photo material. I don't have a GA for this loco thus it will be a bit hit and miss, primarily working from photos which are luckily plenty available in literature. One of the questions to be answered for the type 29 is: cardan drive versus tender drive. The experience with the type 25 points to a cardan drive but a type 29 has a high boiler and lots of space below footplate making it difficult (read near impossible) to hide the gears thus this option is only preferable if it shows advantages in pulling capacity and driving quality. For the type 31, with its low footplate and 3 axled tender, a cardan drive is a logical choice. Weight and pulling power will be same as both these Consolidations have similar dimensions of wheels, wheel base and boiler. The tender was built in 2002 and described in the section on tenders: here. 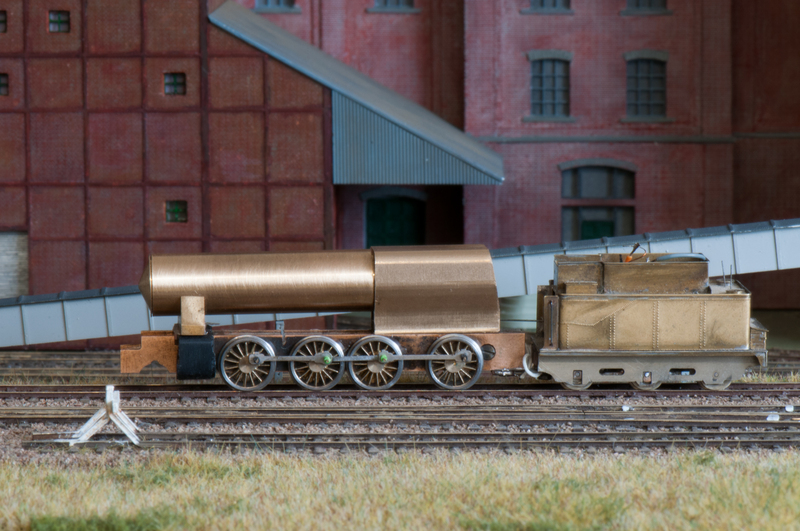 The state of the art of 2002 was captured in the above image, although there are more parts such as dome, chimney, boiler from copper tube and a basic smokebox door. Main problem were the thick wheel centers of the NB wheels meant as replacement drivers for much narrower N frames, at that time the 2mm SA didn't have 9.5 mm drivers. Also the lower part of the Belpaire firebox was not a particularly symmetric fold. Above we see the new attempt with 9.5 mm 2mm SA wheels testing the rods on the rolling road. Above we see a classic split frame of 0.8 mm Phosphor Bronze screwed and glued to spacers of Trespa, at the front sits a 3D printed cylinder block made in ABS. Gearing is 64:1 with a home made end stage of M0.2 36 teeth gear driving via M0.4 10t and 18 teeth both center drivers. Originally I aimed for something lower but somehow I drilled a set of holes for a 10T position instead of 12T intermediate gears. The center drivers have their flanges reduced to 0.3 mm. The temporary cardan is replaced in the mean time by a more permanent one. The tender was already equiped with a single ended 1016FH with 13 mm flywheel. For new projects I prefer the 8 mm Maxon which is not only smaller but also more powerful. The rods are in 3 parts from 0.5 mm steel packing strip with the holes accurately machine drilled but the shaping is old fashioned hand filing using a vice, some pins and the digital caliper for measuring. 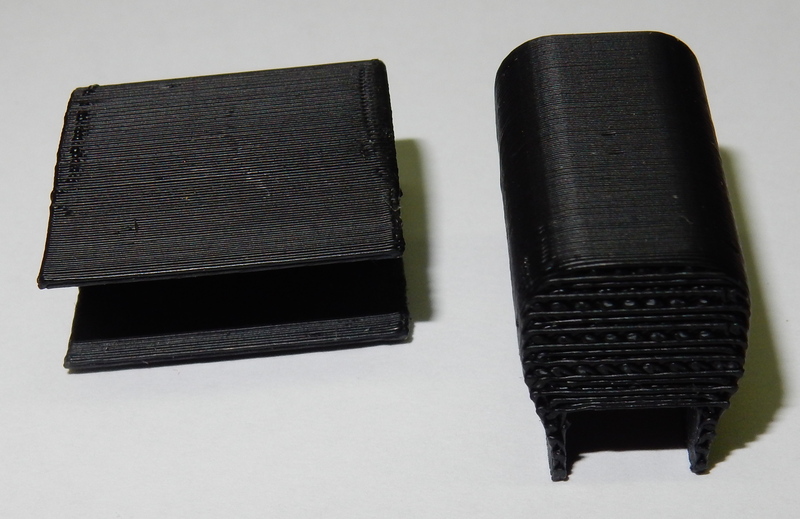 Trial approach on the firebox in 3D in ABS plastic, tested as back-up method, light weight but small effort. 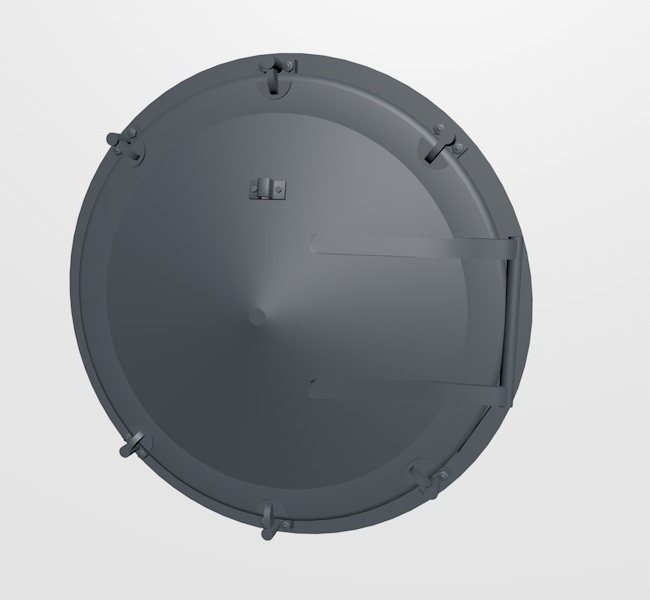 More of the same, a variation on those for other models, visualisation of a 3D smokebox door which will roll directly from an appropiate machine. Slightly more finished firebox with boiler as a test fit on the frame. The boiler still sits too far forward by about 1 mm because it needs a pocket for the gearbox and the whole boiler and firebox is still much (2.2 mm) too high. Weight of the upper parts as seen is 62 g thus enough pulling power. The balance lies nicely between the two center drivers. The long wheel base runs fine through the pointwork on Splitveld Fabriek although in real life it would probably screech due to being tight in counter curves. I would prefer to bring in a tiny bit more side play in the fourth driver for the next one. Over the summer season there was only slow progress with an iteration on refining some of the components. I reduced the height of the boiler and firebox to sit on the correct center line height and constructed a footplate with front buffer beam and milled a fold-up for the cab. Also the gearing was changed to 42:1 by replacing the wormwheel with a 24T M0.3 and appropiate worm. These can be exchanged because of having similar diameters as the original M0.2 ones. 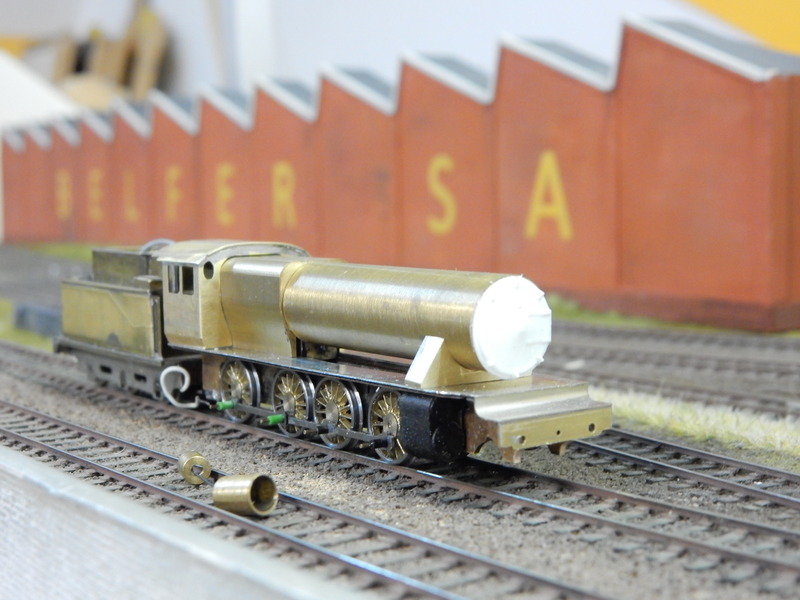 The top speed is now probably higher than the real thing had but this fits the model, its primary use was in main line duties. The loco now runs nicer and quieter, particularly after a good dose of oil into all the axle holes. But some further work is required as it looks that the side windows should sit a bit lower closer to the top of the tender sides and the cab roof a bit higher. Also the vertical part above the curve in the front footplate should be smaller with this height added to the top of the bufferbeam. Slightly higher cab with repositioned and resized windows, cut a bit off of the curved front part and fitted a higher buffer beam, I also made the steam pipe covers a bit narrower. Steps added to the footplate, buffers and Wilson safety valves and covers over the washing plugs on the firebox and the old dome from 2002 now fitted to the boiler. Chimney doesn't entirely satisfy but for the time being I consider it close enough. 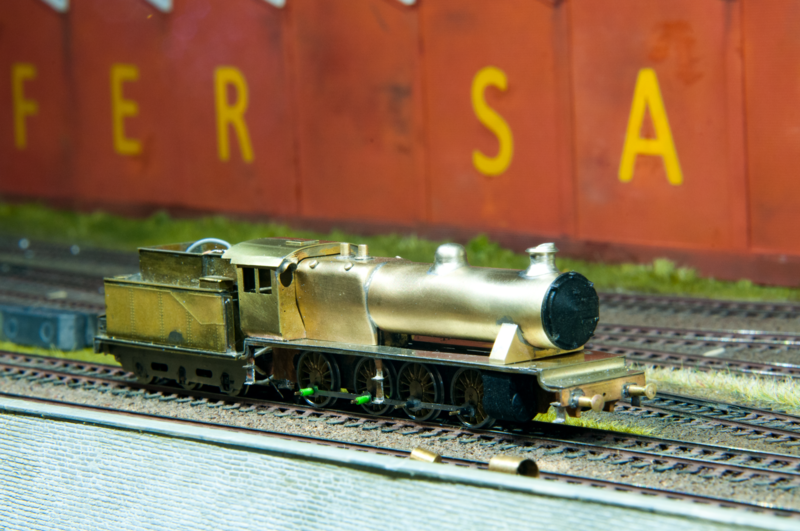 Here we see the handrails added to the cab and boiler. These are from 0.25 mm PB wire on the cab and slightly thicker 0.3 mm spring steel on the boiler to withstand handling. The handrail pins are my usual splitpin solution produced from 0.25 mm brass wire filed to a half flat and stuck in 0.3 mm holes in the boiler. These are still all loosely added here. The 2 stanchions on the front are from an Arnold G8 model, a bit on the thick side but a time saver solution. With the handrails stuck to the cab and boiler these are more or less complete now. 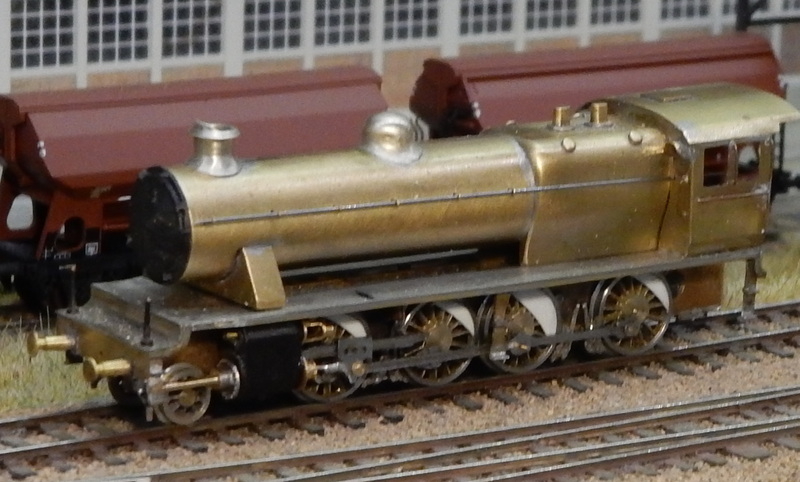 The footplate needs a few more bits such as the Knorr 2 phase air compressor and a few smaller gubbins. But in order to position these correctly I first have to finish the Walschaerts mechanism. Thus now it is back to the frame and complete that. In the conversion program the original moving parts were modified to make these items lighter. The connecting rod is a straight profile with a wide groove with relative thin walls. The groove was cut on the milling machine in a double piece of packing steel using a small Woodruff cutter. The coarse shaping was done with fretting saw and milling machine. The finer shaping with files and the finishing touches will be done with fine needle files and wet and dry stick. When finished the shown part will be unsoldered into two separate handed items. The upper photo shows the assembled crossheads with piston rod, slide bar and connecting rod. The connecting rod is fixed with a turned brass pin into the crosshead. The 2 photos below that show front and back at some stages during production. A set of crossheads was cut from a 2 mm strip of steel using fretting saw and files, this because none of my etched ones had a slide bar height which was high enough. First produce the groove on the back, then cut away what cannot be used. Drill the holes for the piston rods, connecting rod and anchor link, then cut a lengthwise 0.3 mm groove parallel to the front using a fretting saw to make space for the connecting rods. The basic process is described here. Some cosmetic work can still enhance them a bit further, for instance adding the row of rivets along the top and a small rectangle to indicate an oilbox, but first I will produce the remaining failing parts to hang it onto the frame. A relative big step forward with all these parts mounted on the loco. The next photo is a progress photo with the balance weights mounted on the wheels, rods more or less permanently mounted, brakes and the crosshead beams, the crossheads and piston and cylinders mounted on the loco. The frame is still rolling nicely when pushed thus that is a good sign. The brakes are a bit makeshift from an etch I made for the type 64. Special brackets were folded from nickel silver using a jig to get the bends in the right place. These brackets are soldered to the bottom of the frame and hold the brakes. Some cleaning of excess solder is still to be done. The end of the crosshead beam is soldered to another bracket of nickel silver that sits on another bracket of glass fiber pcb material located in a slit in the frames. The cylinder block is screwed with an M1 to the front spacer. A pony was produced and the piston covers on the front of the cylinders are added. The pony was produced from a piece of 7x2.5 mm brass and piece of pcb material. In this case the wheels are home produced 9 spoke NS metal wheels with a diameter of 5.6 mm with an integrated half axle of 1.2 mm. These sit in a 3 mm nylon muff. 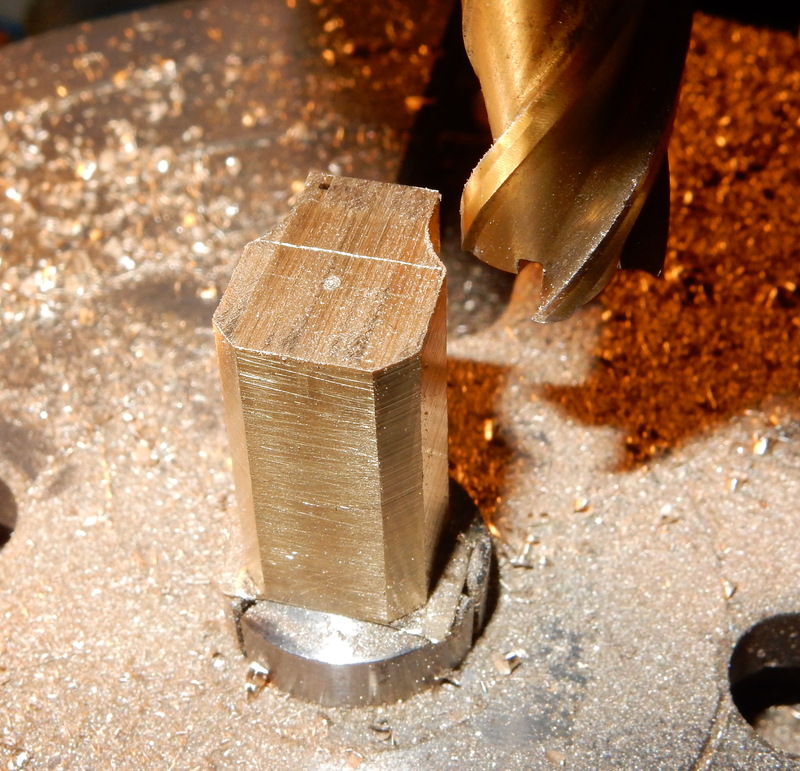 The brass piece gets first drilled for the axle diameter. 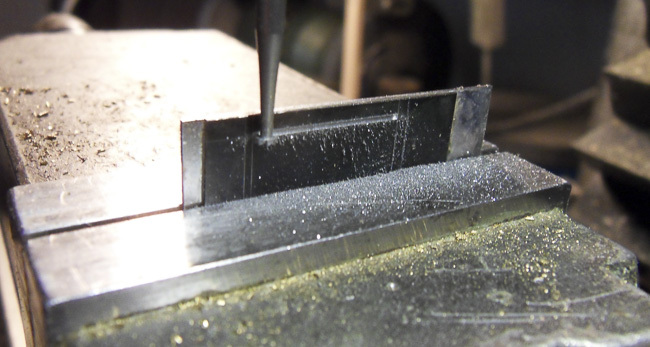 Then the fixing end is thinned to about 0.8 mm thick. 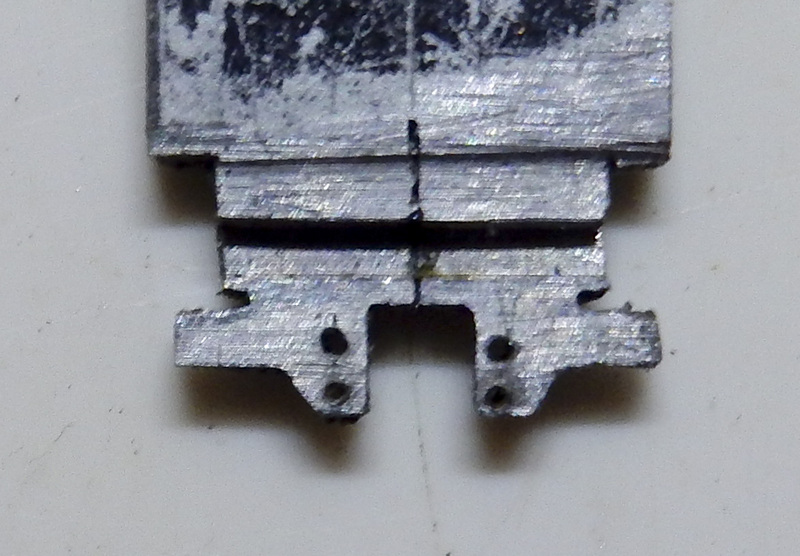 This end gets a lengthwise slot as insulation which sits over a gap in the copper of the pcb material. Then the brass and pcb are laminated into a single unit. After that the still closed end of the brass is cut away using a jewellers saw to leave only 2 prongs of 0.5 mm thick which carry the wheels. This way we know the that the axle holes are exactly lined out. The width of the slot and the length of the muff are adapted for free running. The other end of the pcb gets a hole and a brass bush to screw it in the front keeper with an M 1.4. This end is made a bit narrower to fit between the frame plates with enough play to get around the curves. The piston rod covers are made from brass on the lathe. These are mounted on a ring with bolts that stem from an etch that I made for the type 99 loco. combination lever and anchor link added. The forked combination lever was made up from double thickness 0.1 NS using a special jig to produce the folds. The anchor link is straight forward drilling small holes in double 0.2 mm NS material and filing as far back as you dare. Then the lot is wired up using angling wire, easier said than done. Eyesight seems slowly detoriating with age but I probably should not complain as this still succeeds with my normal glasses. Next step will be producing the remaining bits of the Walschaerts motion: the return crank, eccentric rod, radius rod and expansion link.